« Autumn has Arrived, It’s Time for Pumpkin Recipes! you are trying to kill me. i am dying from teh cute. Michelle: Glad you like them! Annie (on the right) is my sister's new English Mastiff puppy. 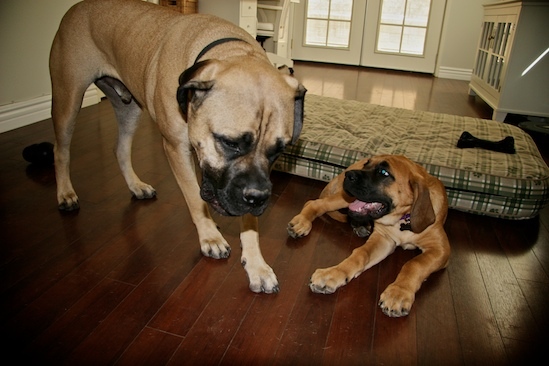 She's three months old and her paws are already the same size as Wilbur's (one-year-old Bullmastiff on the left)! I spent yesterday afternoon puppy-sitting and it was a lot of fun watching them play! oh my gosh. aDORable. no words required! Just found out it is hard to snuggle the computer screen. But those ears!!! Oh my goodness! Little Annie is too cute! And those feet! They're huge! She is going to be one big adorable dog. The look on Wilbur's face. Come On! Enough already~ when is she going home? Too, too cute!!! Double the slobbery kisses and love, wonderful! They're adorable!! !, I love dogs, in fact I have five!!!. My best wishes for a long live to your dogs :) . Congrats!! they are totally cute! Too cute! And dang big feet on those dogs! Aww, those two are darlin! This makes me want a puppy just like that. My two dogs would absolutely stroke if I brought one home!! Awww. What a sweet pair! Uh... hellos. Yoo look new here.Mom and dad did mention something about a new chew toy. such a sweet picture! adorable puppy! congrats! Oh gosh..Annie's gonna be huge by judging her paws!